In generating hype for the launch of Halo 3, Microsoft spared no expense. I remember watching the Believe campaign in awe as the video game I had been playing for years was brought to life in a non-digital form. Microsoft produced this series of live action commercials to promote the game, building on the lore of the Halo universe. By showing elderly “veterans” of the Halo battles recounting their war stories, the Halo marketing campaign broke new ground in how to effectively promote a video game. My dream job would be to work in a museum or Hollywood modeling studio and create miniature worlds. It’s an art form that is quickly fading as CGI takes over the world, but there’s just something about a detailed diorama that gets my juices going. Seeing the massive Halo diorama in the commercials combined two of my favorite things, and I am not ashamed to admit to the level of sheer joy I received after viewing it–repeatedly! I think that the diorama is on display at Bungie Studios or Microsoft headquarters, and you can bet that is on my bucket list of places to visit before I die. 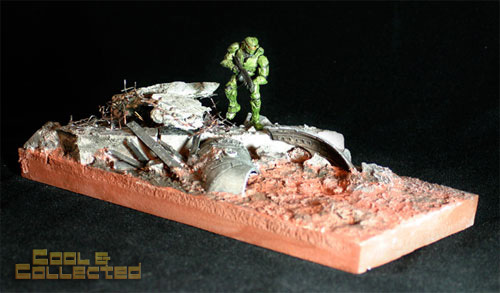 I have thought on many occasions that I would someday create my own Halo diorama on a fairly grand scale, and actually made a test scene with a small figure. McFarlane Toys recently announced a new line of miniatures that they will sell later this year, and I have a sneaking suspicion that my urge to finally build that diorama might be severely tested. About a year ago, portions of the diorama were put up for bid at Profiles in History. I hated to see the diorama taken apart, even if only partially, but I can’t lie in saying that I desperately wanted a piece of it. 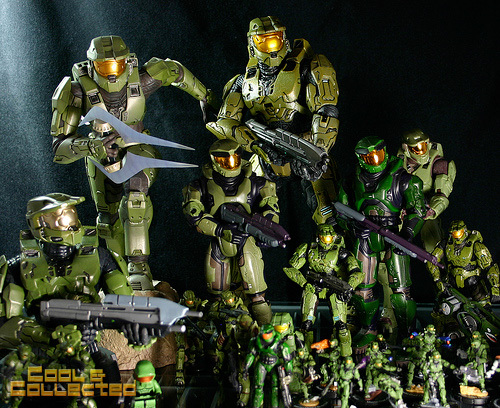 Admittedly, I am a huge Halo fan, and have read all the books, played all the games, and watched the animated movie, and Halo is the one modern franchise that I actively collect. So, it’s no surprise that this campaign had me throwing fist pumps into the air whenever I saw one of the commercials. I was excited to play the new game, but I almost wanted a live-action Halo movie even more. Needless to say, when Halo 3 was released, I was first in line, and I still spend more hours playing it than any other game. It absolutely lived up to the hype it generated in the marketing campaign, and I can’t wait to see how they try to top it as Halo 4 is due to be released later this year. The bar has been set very high. This is the latest post in response to the weekly blog challenge presented by the League of Extraordinary Bloggers. This week’s topic asked what media announcement had you throwing fist pumps and doing roundhouse kicks in the air, and did the final result live up to your dreams? I am totally with you, Brian. I planned my vacation around the release of Halo 3, and it was so worth it. I played co-op campaign with friends until dawn two days in a row. Perhaps it was the sleep deprivation, but when we finished the campaign with that last crazy Warthog ride, we were cheering as though we had actually beaten the Covenant. Halo was the first video game I played–when my husband and I first started dating ten years ago, he took me to his friend’s house one Friday night. They taught me to play Halo, and I was hooked. We started playing every Friday night, hooking up 2 or 3 systems together and playing people online pre-Live over GameSpy. (I was terrible at first, but on Sundays my husband would put me through Halo Boot Camp.) I’m not the greatest player by any stretch of the imagination, but I can hold my own. I spent many Friday nights sitting around the kitchen table with friends playing Halo, which was my first real endeavor into online multiplayer gaming. When I think about how many other games I have played, it’s amazing how Halo has kept my interest for so long. No other game comes close to matching the hours I have spent fighting the covenant and red vs blue. The funny (sad) thing is, that the older I get, the worse I seem to get, but it’s still my go-to game when I feel like firing up the XBox.